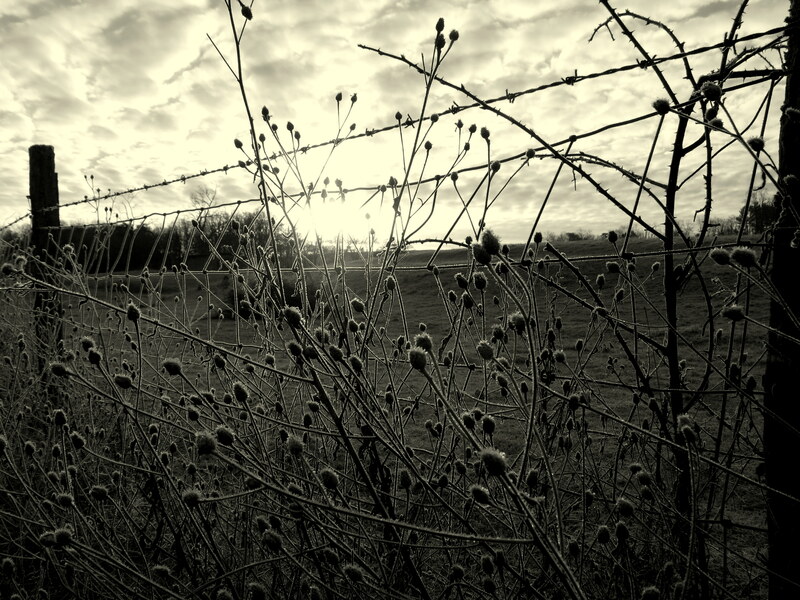 This entry was posted in Black and White, Macro, Photography, Winter and tagged B&W, Barbed Wire, Macro, Morning Frost, Photography. Bookmark the permalink. Beautiful shots Laurie 😀 I really love the first one but great job on both of them. Absolutely!!! I wonder how you might have edited that second one … I wondered if the sun stream was too bright. Whatcha think? Good Morning Starshine is what I’m hearing in my head looking at your gorgeous photo. I’ve pinned for a reminder to get up early for these kinds of opportunities. Love the sky. Whatever you do, it’ll be fantastic. I’ll have to get over to FB tonight. We just finished watching Idol. Do you tune in to that? Some of these kids are so young and poised, amazing. I love them both, but that first one is really nice. I have had a thing for barbed wire, and antique fencing, since my geese found some (BW) from the 1800s here on our property. Did you post about that old barbedwire? The story sounds familiar. Me, too! I loved that it was covered by frost. Thanks Doreen! 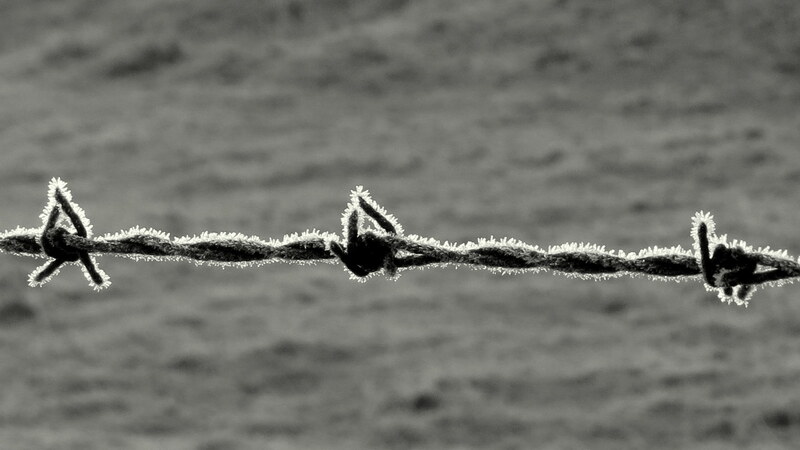 I love your close up of this barbed wire….the frost looks so cool! Nasty stuff that barbed wire – but turns out it’s particularly good for showcasing frost – who knew! Takes your fabulous eye again!! The light in the second pic is quite something – those clouds look pretty thick, so the sun must be lower – right? Yes! It was early in the morning, and I was rushing to work, and the sun was just coming over the hill. Next time, I’ll take that shot and make sure I grab more of those clouds. Thanks Pauline! Thanks Elina … I really wish I had had time to really focus on the morning, and the frost, and the beauty. you are so good to comment and I’m grateful! I love the second image Laurie! Gorgeous! I so appreciate your comment, Robyn, as I love your work! Thanks so much! Hey, how are things going with the new job? oh my … hope you find some creative time soon. Good luck! Cheers, hopefully will all settle down soon..
Who would think that frost could be so lovely to photography. I love the effect of it. That second image is fantastic. You know, Leanne, I’m so glad the second one has been so well received … I really wasn’t sure because of all the sun flares. Thanks!! Beautiful capture of the wire. 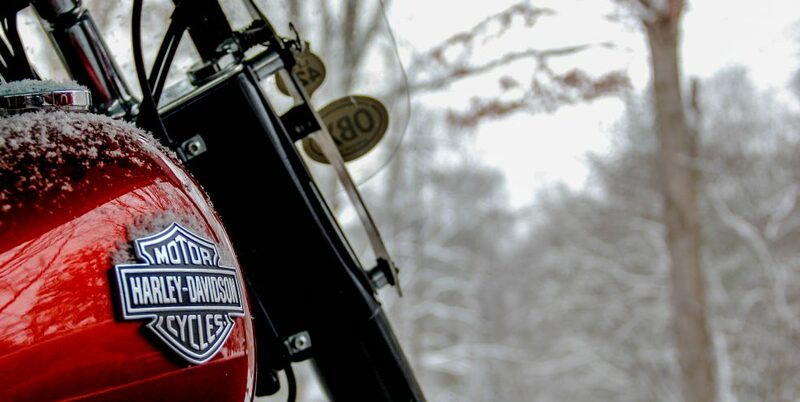 Hope you are keeping warm these days! Great pictures. . . I especially like closeup of the frost on the barbed wire. I like that one, too!! Thanks Sheryl! You are really getting good with this camera my friend. The second photo is a real charmer. Thank you, Laurie. I’m so glad you liked the second one … I wasn’t really sure about it! I am drawn to the second one. Is this from the same day as your “amateur mistake” or did you go back? The light behind the seed pods (what are those, grass? thistle?) is compelling. Good question, Crystal! It was the next day 🙂 and I don;t know what those grasses / seed pods are either, but I’m always drawn to the light behind them. You’ve captured the watery silky quality of this late winter light beautifully. What a great description! You have such a way with words, Seonaid. Your second photo has real impact. Love the toning and the unconventional composition. Thanks so much ,,, I’ve commented previously that I’m so pleased that the second one has been liked. It appealed to me but I wasn’t sure about the quality. I can remember going to photography exhibitions of some of the ‘greats’ of photography and enjoying their fuzzy and grainy photos, and although it would be unlikely that I would win any camera club competitions with a similar one, to me that’s not the point. Your photo has real impact, and I love images like that because it captures more than just the place, it makes me ‘feel’ the experience of being there. That’s more than enough for me. Keep up the good work. Always love your black and white photos. I can’t quite decide which picture I like more..Very apt caption! Thank you … I made the second one B&W because the solar flare was so bright. It turned out even better! This frosty scene completely melts me! Ah, I love these shots!